In the course of my master gardener training, I had the privilege of attending a seminar on food preservation. At the time, I was basking in the glow of my new canning skills. Shimmering batches of kiwi-strawberry preserves, jalapeño pepper jam, and other weird combinations lined my pantry shelves. Packed with sugar and boiled to death, canned treats were fun to have around, but much of the foods' nutritional value was lost. Fresh beets and turnips are packed with winter goodness. The seminar on fermentation as a method of preserving fresh foods, led by Monica Corrado, of Simply Being Well, introduced me to an entirely different ball game. I'd eaten plenty of kim chi and sauerkraut, but never gave a thought to how they were made. I just assumed they were "pickled." 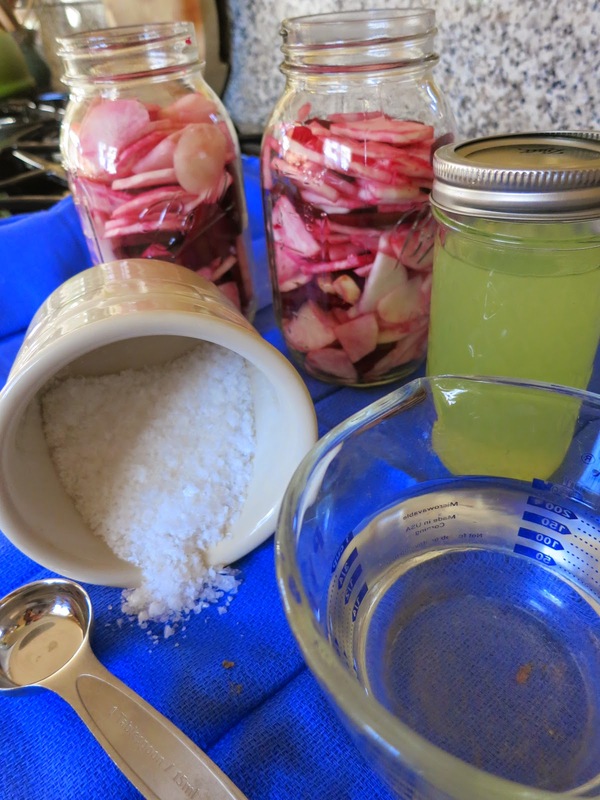 Monica explained that fermentation is an ancient and widely overlooked method of "pickling" that involves the breakdown of carbohydrates into lactic acid, or sugar into alcohol. While hot water baths required for canning essentially destroy nutrients, fermentation awakens healthy bacteria that enhance foods' nutritional value. Fermentation is far easier than canning, since it requires neither the intense sterilization process, nor the dance with danger that ensues when working with enormous cauldrons of boiling water and glass jars. Fermentation simply requires finely chopped vegetables, clean glass containers, and a little counter top space. Using the wonderful guide, Nourishing Traditions: The Cookbook that Challenges Politically Correct Nutrition and the Diet Dictocrats, by Sally Fallon, I recently whipped up ginger carrots, as well as pickled turnips, beets and garlic chives. Using a Cuisinart food processor, I evenly chopped the vegetables. I strained some whey from home-made yogurt (another wonderful fermented food), mixed it with a little salt and water, and poured the mixture into clean quart-size glass jars. After three days on the counter, the liquid fizzed around the vegetables. A taste-test led to lunch, which led to a daily serving of stomach-enzyme balancing delight. Eaten plain, with salad, or layered in a sandwich wrap, we'll have a healthy treat on hand for several months. Fermented foods last a long time in the refrigerator, adding a little zip to tired winter days. countertop in time for Valentine's Day.